Established in January 1984, POPULAR Book Company (M) Sdn Bhd has become a household name in Malaysia and has now grown to more than 97 stores nationwide. It is recognised and listed by the Malaysian Book of Records as the largest bookstore chain in Malaysia, with over 800,000 square feet of retail space. 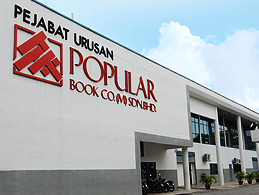 POPULAR Book Company (M) Sdn Bhd is 100% managed by Malaysians and is strongly positioned as a trilingual one-stop bookstore catering for everyone from all walks of life. Its 4 mega stores in the Klang Valley, Penang and Johor Bahru offer a conducive and relaxing ambience for a whole new reading and browsing experience. In addition to retailing, POPULAR Book Company (M) Sdn Bhd has 3 other core businesses: book distribution, publishing and e-learning.